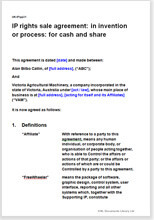 This is a heavyweight agreement for sale of rights to an invention or technological innovation. You may be an individual or represent a company. Your work may be applicable in one industry or many. It could be anything. You want to sell all rights to a major manufacturer. Sale limited to a particular market or industry. You probably intend to sell rights for use in other industries or to manufacture it for your own use in your industry. We have named the subject of this product “Freewheeler”. You can rename it or give it an abstract legal name like “Licensed Product”. This agreement covers whatever intellectual property rights you decide to sell. The description and specification is up you to agree with the buyer. It provides for a single and final payment. Once sold, the buyer can do what he likes with your invention or computer game, subject to the restrictions of the sale. When you sell, you are parting with certain rights for ever. But that does not means that you cannot retain some or most of the total “basket” of rights. We assume that this sale will be of rights in a particular industry sector or field. That leaves you with many opportunities to sell other rights in different sectors or countries. Over 1,200 words of helpful drafting notes.